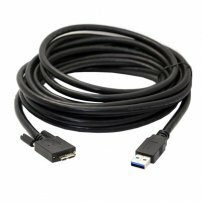 16 feet (5M) Ultra Long USB 3.0 Type-A (USB-A) to USB 3.0 Micro Panel Mount Cable for HDD / PCs [USB005191] : Onchee.com - the accessory shop for all your handheld Electronics! - It will takes longer time to get your device fully charged as it is a very long cable. - You may need to use a high-power USB Charger to get your device charged. - Net Weight: 260g approx.